What an exciting idea it is for a preschooler to have his or her Dora birthday party! Let’s start an amazing adventure with these Dora the Explorer party ideas. Make your Dora birthday party invitations out of a cardstock paper. They should roughly be 5″x7″ in size. Design the front outer boarders of the invitations with pictures of Dora the Explorer and her friends. You can even have the picture of your child among them. On the back of your invitations you can draw a simple map of your neighborhood. Just include known landmarks like a school, mall, restaurant, etc. on your map. Remember to mail your invitations 2-3 weeks prior to Dora birthday party. Decorate your backyard and house with balloons in theme colors – blue, purple, orange, pink and yellow. You might also want to have Mylar Dora the Explorer balloon. Have paper streamers in green to make them look like vines. Create a Safari scene in front of the house that you can use to take pictures of all the children! Send those pictures along with thank you notes after the party. Spruce up your walkway and/or backyard with flower decorations. You can also hang bright paper lanterns on tree branches. Cut out some animal footprints and spread them on the driveway. Hang several Dora the Explorer posters along with jungle theme pictures on the walls (i.e. pictures of bright shining sun, palm trees, tropical animals, etc). Make sure to have arrows or signposts around your house which will lead the kids from one activity to the next. Set up Dora hideaway that younger kids will love sneaking away to in between the activities. Decorate your table with Dora tablecover and have a theme blowout for a centerpiece. Start your Dora birthday party by welcoming all your guests with a big party welcome. Hand each Dora birthday party guest a “map” with the names of all Dora party games and food items that you are planning to have. Spread those Dora activity names out on a sheet of paper and have the arrows leading from one activity (whether game or food) to the next. *Friendship Bracelets: Divide kids into pairs. Give each child a string and beads. Ask them to string beads around the string to make bracelets. Get them to give a complete Dora’s Friendship Bracelet to their partner. Be ready to assist the kids if help is needed. *Dora’s Binoculars: Have the children tape two rolls of toilet paper (or one paper towel roll cut in half) together. They can cover the ends of the “binoculars” with colorful plastic wrap. Then secure them in place with rubber bands. Next, let your Dora birthday party guests decorate the binoculars with adventure-related stickers (jungle, safari, backpack, etc. ), glitter glue and markers. *Colorful Paper Plate Shakers: Hand out a white paper plate to each child. Have them start decorating the underside of the plates with markers, glitter glue, stickers, or tempera paint. Let the plates dry. Place some dry beans, dry macaroni, etc. on each plate. Next, fold over the plates and tape securely around the edges. Ask the kids to make some noise with their “paper plate shakers”!! *Monkey Face Craft: Have the kids create cool monkey faces that they can take home after the party. For Dora party favors, you can have favor bags for every child. Fill the bags with theme items, like compasses, binoculars, Dora’s bracelets, stickers, and so on. I personally like this Favor pack because of its great value. *Great Adventure Obstacle Course: Set up an obstacle course with household objects like chairs, tables, cardboard boxes, pillows, etc. Hang green paper streamers like vines over the course. *Backpack Discovery: Select household items with interesting shapes and textures. Fill your backpack with them. Have kids sit down in a circle. Pass the backpack around. Allow children to feel the items in the backpack. Ask them to grab one item and try to guess what it is without looking at it. If the child guesses right, he or she gets to keep the object as a prize. When he or she says “Swiper”, the tapped guest will get up and chase him or her around the circle. The goal is to tap the child before he or she can sit down in the open sit. If Swiper succeeds, he gets to go around and tap other players repeating the process. *Dora’s Soccer Course: This is a great active outdoor game for your Dora birthday party. You will need a child-size soccer ball. Design and draw a map of an obstacle course prepared in your backyard or local park. Include such obstacles as trees, bushes, slide, sandbox, log, flowers, etc. Have a final goal at the end of the course – actual soccer net or a pair of sweatshirt will do just fine. Review the map with all the children so they understand how to go through the obstacle course. Clarify all the details to them. For example, explain that they would need to dribble soccer ball around the tree or kick the ball over the sandbox. Roll the soccer ball over to your birthday child. Encourage him or her to dribble the ball around the obstacle course. Get the other kids to cheer!! Let all the children go through the course. As they kick through the final goal, celebrate by singing “We Did It!” song. *Dora Dice: Dora Dice (pronounced dee-say, in Spanish “says”) is a variation of Simon Says. Have birthday child to be Dora first. Get her to lead the group by saying things like “Dora dice jump” (hop, clap your hands, turn around, etc.). When she exclaims “dice”, all the kids are supposed to follow her movements. On the other hand, if she doesn’t say “dice”, the kids should stay still. Have other children play Dora as well. *Dora’s Circle of Friends: Glue pictures or place stickers of Dora characters on paper plates. 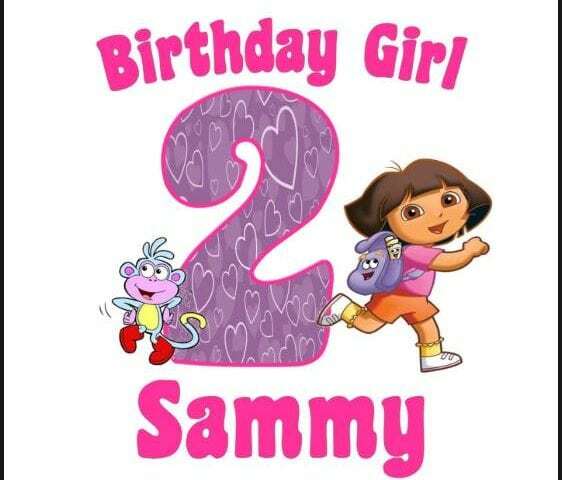 Distribute one paper plate for each Dora birthday party guest. Write the character names on small pieces of paper, fold papers, and put them in a hat. The game starts with children putting their plates in a circle on the floor. Next, play Dora’s theme CD with kids walking in a circle when music starts. When the music stops the children must hop on one of the paper plates. Pull one character name out of the hat. Whoever is standing on that character’s plate is out of the game (remove that plate out of the circle). Keep the game going until there is only one person left remaining in a circle. *Dora’s Basketball-Puzzle Game: Prepare a child-size basketball and a basketball hoop (or a bucket). Plus, get two large animal posters. Glue the posters to cardboard or construction paper for sturdiness. Draw and cut out small puzzle-like pieces out of each poster, so you have an animal puzzle (To save time and effort, you can just buy two animal puzzles). Divide the group into two teams. One player at a time, children attempt to make baskets with a ball. Alternate players from each team. Give the team a piece of a puzzle for each basket made. The objective of the game is to figure out the animal in the puzzle. *Dora Treasure Hunt: Before the game hide treasure in your Dora birthday party room or backyard. Hide three treasures per child (you can use things like Dora’s bracelets, bubble bottles, toy binoculars, etc.). Draw a treasure map highlighting three landmarks (sofa, TV set, tree, sandbox, etc.) where the treasure is hidden. Let the kids find the treasure. Help them if they get stuck. You can use treasure items as Dora birthday party favors. *Jungle Weave: Lay paper streamers on the floor or ground. Have kids each grab the end of streamer and then form a circle. Tap children counting “Uno, dos, tres, cuatro, cinco, seis, siete, ocho, nueve, diez”. Next, get the even-numbered kids go under the streamers to their right, and odd-numbered go to their left. They can repeat it several times. The streamers will get tangled. The objective of the game is to untangle the streamers. Children will have to work together with their partners who are holding the opposite end of the streamer. *Dora Cake: Buy yellow cake mix and prepare the cake according to mix directions. Frost the cake with white frosting. Cut out a picture of Dora from paper plate, napkin, wallpaper printout, etc. and place it on top of the frosted cake. Trace the outline of Dora with a toothpick. Remove her picture from the cake. Draw Dora’s outline with cake writing gel by tracing over the lines you left with a toothpick. Use brown color gel to decorate Dora’s eyes, pink color for her shirt, purple for the backpack, and so on (use picture for guidance). Mix green food coloring and shredded coconut. Spread the mixture under Dora’s feet for grass. You can decorate the cake with palm trees: use small pieces of chocolate licorice sticks for tree trunks and spearmint gumdrop leaves for palm tree leaves. Your Dora Cake is ready! *Boots the Monkey Cake: Cut 2 cupcakes in half vertically. Prepare 1 round cake according to directions. This will be monkey’s head. Place one cupcake half on each side of your prepared round cake. This will make monkey’s ears. Place another cupcake half in the center of the round cake for a nose. Dye the white icing purple with the purple food dye. Then ice the whole cake with it. *Explorer’s Empanadas: Buy packaged pie dough. Divide it into 12 small balls. On a lightly floured surface, roll each ball into a circle. Combine about 2 1/2 cups of finely chopped cooked chicken, 2 tbsp blanched slivered almonds, 1/4 cup raisins, 1 tsp chili powder, 2 tbsp mild salsa, and 1 egg in a mixing bowl. Put 2 tbsp of the chicken mixture on each circle. Fold the circles over and press the edges together to seal the empanadas. When the empanadas are ready for cooking, you can either fry them in hot oil for 3 minutes on each side or bake them in an oven that has been preheated to 400Ā°F for 15 minutes. *Star Catcher Taco Stand: You’ll need ground beef, taco seasoning mix, taco shells, salsa sauce, sour cream, guacamole, chopped tomatoes, chopped cilantro, chopped onions, chopped lettuce and shredded cheese. Cook ground beef with taco seasoning mix. Place all the taco ingredients into several bowls. Spread the bowls out on the birthday table. Let your Dora birthday party guests pick ingredients and help them prepare their tacos. *Postre de Mango (Mango Mousse): You’ll need 1 fourteen-oz. can of condensed milk, 2-lbs of fresh ripe mangoes (peeled, cored, sliced), 2 tbsp lime juice, 1 cup chilled heavy cream…Put the condensed milk, mangoes, and lime juice in a blender. Puree the mixture until it becomes smooth. Whip the cream until it’s almost stiff and add into mango puree using spatula. You can pour it into individual dessert dishes or one large container. Chill the mixture for at least one hour before serving. Garnish with sliced bananas or strawberries. *Purple Monkey Punch: Mix grape sherbet and club soda (or ginger ale) together. Garnish with sliced bananas. *Boot’s Orange-Banana Smoothie: Mix vanilla yogurt, ripe bananas, orange juice, ice cubes in blender. Pour into hollow coconut shells or glasses and serve with straws. *Monkey Milkshake: Combine 2 cups of nonfat milk, 1 medium banana, and 1 tsp unsweetened cocoa in blender. Blend until smooth. Repeat the process to make sure you have enough milkshake for each Dora birthday party guest.